Around this time of the year, the some of the taxpayers plan their investments for tax purposes. 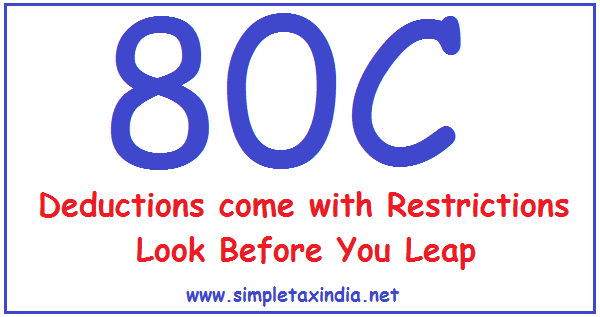 Section 80 C allows you deduction upto Rs. 1.50 lakhs in respect of some investments and expenses. Though everyone uses this benefits only a few are aware that these deductions are subject to some restrictions with respect to qualifying persons and the period for which you need to hold the same. Let us discuss these now. An individual or an HUF only can claim deduction for Life Insurance Premium paid. An individual can claim deduction for Life Insurance Policy on life of himself, his spouse or his children. So as a parent you can claim tax benefits for life insurance premium of your children whether dependent or independent but reverse is not true and thus children can not claim tax benefits in respect of life insurance premium paid on life of parents. The HUF can claim deduction for premium on life of any of its members. Moreover there is also a lock-in period of two years till then you cannot terminate or let the policy lapse. In case this happens, the deductions allowed in earlier years are added to your income of the current year. Note By STI :Further person shall be eligible for deduction only to the extent of 10%(20% for policy taken up to 31.03.2012) of the actual capital sum assured.However person with disability u/s 80U/80DDB can claim 15% of the actual capital sum assured for policy taken after 01.04.2013. Also read 80C Investment whos Name you can Invest. Your children’s tuition fee is eligible under Section 80C, but with some conditions. You can claim this only for two children and that too for the educational institution situated in India only. In case you have more than two children, the deduction in respect of other children can be claimed by your spouse if your spouse has taxable income. The deduction is available for tuition fee paid only. So any amount paid as donation or for development charges will not qualify for deduction. Deduction for repayment of home loan too is not without restrictions. The deduction can be claimed only if the loan has been taken from specified financial institutions or entities like your employer a public limited company, central government or state government or board, corporation, university established by law. However in respect of loans taken from your relatives though you can claim deduction under Section 24b for interest, the deduction under Section 80C for repayment is not available. The claim for deduction can only be made after you have obtained possession of the house though the repayment might have begun when property is still under construction. In case you sell the property within five years from the end of financial year in which possession of the property was taken, all the deductions allowed earlier shall be treated as income of the year in which you transfer the property. Please note there is no restriction as to prepayment of the home loan even before five years from the year in which possession of the house was taken. It is interesting to note that there is no such provision for reversing the deductions allowed for interest even if you sell the house within five year. It is also interesting to note that the deduction is available for residential property only and is not for commercial property. You cannot open a PPF account in the name of HUF after May 2005, however as per the provisions of the income tax act, the HUF can still claim deduction in respect of contributions made to PPF accounts of member of the HUF. You can claim deductions in respect of PPF contributions made for yourself, your spouse and your children even if not dependent on you. Let me point out that only PPF contribution is the pure investment item where a you can claim deductions for deposits made in the PFF account of your child and spouse. Since gift to your child is exempt and the clubbing provisions will not have impact as PPF interest is exempt, By contributing to PPF account of your child you can help him build a substantial corpus and save taxes at the same time. Those who have completed 60 years of age, can claim deduction under 80C for money deposited in account under “Senior Citizen Deposit Scheme” which have to be maintained for five year. However if you withdraw the deposit before five years, the amount withdrawn shall become taxable when you withdraw in case deduction has been claimed earlier. However any money received by the nominee or legal heirs even on closure of the account due to death of the account holder even before five years shall not be taxed. ELSS( Equity Linked Saving Schemes) of Mutual Funds have gained popularity since these have given good returns over the long period of time. The units allotted under ELSS schemes have a restriction as to holding period of three years. This is the shortest holding period in for pure saving based investments under Section 80C. In case you sell the ELSS units before three years, the deduction claimed earlier will become taxable in the year of withdrawal. In case the investment was made through Systematic Investment Plan, three years will be calculated with reference to the date of each such SIP installment. So now you are aware about the restrictions for items covered under Section 80 C as regards when and from whom you can claim this and also the period for which you need t hold it. Also read 80C Investment whose Name you can Invest. kindly answer as it is urgent. regarding tuition fees: She has paid the college fees for our kids from her account, out of that partly is the tuition fees....now if I want to claim deduction, can i transfer the amount equal to the Tuition fees to her account and claim the deduction or it is not advisable. Yes you are correct, Individual can claim premium paid for life insurance premium for policy taken on Name of Spouse (wife/husband) or any child on Individual.